Hamburg aka. the gateway to the world, welcomed merchants, sailors and travellers for centuries. The second largest city of Germany is best known for its nightlife, northern brick architecture and maritime flair. Whether you are in Hamburg for 48 hours, a week or indefinitely, here’s how to make the most of this exciting harbor city. As I am a Berliner, Paulina from Hot Yoga Norderstedt helped me finding the best of the best. Let's start with the first walk through Hamburg. 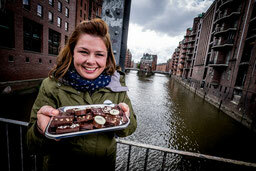 Sweet café with Tyrolean flair is located in the heart of Hamburg. Here you can enjoy a delicious breakfast or brunch. We especially recommend the alpine butter breads with hearty farmer's bread. Guten Appetit. 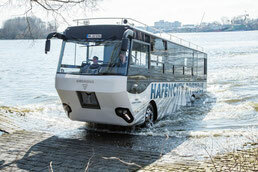 Ever seen a bus-boat? First bus to drive and cruise! This tour is extraordinary and definitely worth it. 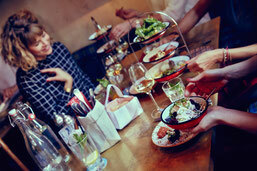 Hamshuka, Shashuka or simply Hummus – NENI is the perfect spot for a lovely meal. It’s Israeli cuisine will enchant you for sure! This museum is one of a kind. The Dialogue House opens the doors to the worlds of complete darkness, of total silence, and of ageing, enabling you to experience the rich potential within them. Broaden your horizons in their three fascinating exhibitions: Dialogue in the Dark, Dialogue in Silence, and Dialogue with Time. If you are looking for an even more intense experience, you may also want to try their dinner in the dark. 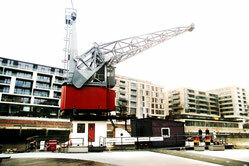 A museum located on a floating crane- this happens only in Hamburg. Funky seamens’ treasures and more to find! 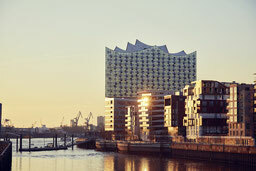 It’s the flagship building of the Hafencity housing one of the most luxurious apartments in Hamburg. A good place to spot German celebrities. A cozy place within the Elbphilharmonie concert hall to enjoy hearty snacks, Nordic cuisine and German craft beer together with a panorama view at the harbor. 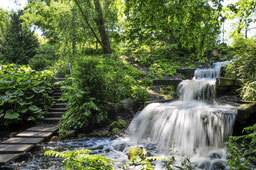 This inner-city park has a lot more to offer than plants and flowers. Enjoy its wonderful water light concerts every day during summer. You love healthy food options?- Then this ist the right place for you. MAD about juice offers mad smoothie bowls, too! It’s the flagship district against gentrification. Until the middle of the 20th century, this area extended from the port of Hamburg to the city centre and offered a home to thousands of working families. Only a few remnants of the districts were long forgotten along the Bäckerbreitergang and between Caffamacherreihe, Valentinskamp and Speckstraße - the birth street of the composer Johannes Brahms. And, hooray, they're still standing! Today, run by a companionship to create new cultural space for art and social movement. A lot of the houses have a history, which you can often read about on their walls. Definitely a must-see! Every first Sunday of the month at 15:00 'Verein Gängeviertel e.V.' offers a guided walk through the district. You can participate without registration, they always meet at Fachwerkhaus, Valentinskamp 34 in Hamburg. Here you also find a wonderful tea store with tea from Tea Addicts called Teedeeler, where you can have a lovely break. In its narrow streets you will not only find hip boutiques, cafés and bars, but also the Hamburg Dom, the St. Pauli football stadium and the Planten un Blomen park are not fare! It‘s the biggest street art museum in Hamburg. 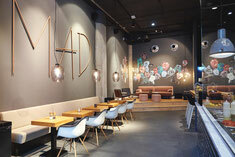 Located between St. Pauli and Sternschanze it conceals the very special alternative charm of the city. It‘s the symbol of Hamburg’s autonomous scene. A former theater now occupied by leftists is the landmark of the cities alternative movement. 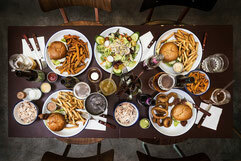 Otto's burgers are among the tastiest in town! The burger chain, which is not really a chain, because every store looks individual and different, is well-known in Hamburg. Named after the chef Otto Kuase, who is said to have invented the hamburger in 1891, is a must for fans of burger. Small and extra charming- named after the Fräulein miracle of the 60ies it offers Scandinavian fashion for women all age. This studio offers (Hatha) Yoga in a quiet backyard in the heart of Hamburg's cloudy Schanzenviertel. The idea behind their name is the imagination of the restless mind, like a cheerful monkey swinging from branch to branch in a huge tree. So if you want to get out of your mind carousel for a while and do something good for your body, the Monkeys are the place to be for you. Namasté. The butcher's fair in the Karoviertel is a traditional restaurant, even by Hamburg standards: opened in 1970, when the slaughtering really took place next door; until today owned by the family Süße. 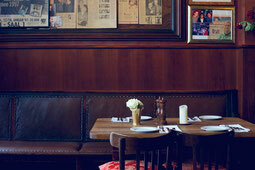 The Schlachterbörse is not like other restaurants, as they're just serving steaks. No Farm Fed Wagyu Prime Cut Dry Aged Porterhouse etc. , just 'ox cutlet' or 'fillet steak'. The fillet is exactly rare, without blood running out. The chop is evenly medium rare, which is not so easy when cooked on the bone. If you like meat this is definitely the right spot for you. Cosy sofas it’s all it is about! Zoé bar has been a part of St. Pauli for over 20 years. They offer good beer and a great atmosphere.